Fundado en febrero de 1984. Conmemorando el 130 aniversario del nacimiento de Gabriela Mistral el 7 de abril de 1889. The Gabriela Mistral Foundation, a partner of Sigma Delta Pi, provides each Gabriela Mistral Awardee a copy of the Foundation’s book From Chile to the World–70 Years of Gabriela Mistral’s Nobel Prize. Granted to an outstanding graduate or undergraduate student of Spanish who is an active member of Sigma Delta Pi and who has demonstrated noteworthy involvement and initiative in his/her chapter. 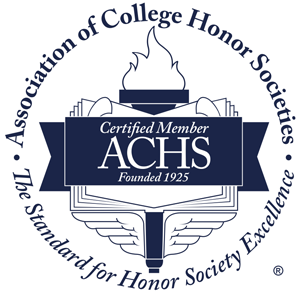 Honorary members are not eligible. Any active chapter may nominate one student per year for the Gabriela Mistral Award and shall send the nomination together with supporting documentation, including at least two letters of recommendation and a current transcript, to the Executive Director. Winners of the award will be given a beautiful certificate compliments of Sigma Delta Pi and the book De Chile al Mundo compliments of the Gabriela Mistral Foundation.